The day finally came. I was running a particularly graphics intensive plug-in on my 2011 MacBook Pro, then suddenly it went into a reboot loop, never to return properly. It seems that the GPU overheated for the last time and gave up the ghost. Ah well, it's been a good ride Apple, but since they started gluing kit together rather than using screws, they've lost the trade of people like me who like to be able to get under the hood and do upgrades and maintenance myself. My MacBook Pro was pimped up from its original specification - it had a Samsung SSD and 16GB of RAM installed, but it being an Apple laptop, that was as far as it could be upgraded. Laptops are the ultimate "crystal ball" purchase - you have to think ahead in time to try and predict what you're going to need. As the MacBook Pro 2011 was ahead of the game when it was released, although it was showing its age, it still had Thunderbolt, which unlocked a whole raft of newer standards, like HDMI and USB3. Given that it was still a viable machine, in my opinion, I sought out advice on getting it repaired. The news was not good. I was looking at at least £500, for a repair that might well fail again, because of the inherent cooling design flaw, which leads to the kind of failures I've had twice now. The previous time round, Apple were offering this repair free through a special program, but those days are long gone. At first, I wasn't too upset about my MacBook Pro dying - I'd been having increasing problems with its comparative lack of power, particularly in the GPU department - the drag of the weedy AMD6450 512MB graphics card was making running graphics hungry plug-ins nigh on impossible and some plug-ins were even too big for the screen resolution! But then I started to realise what I'd lost. I'd lost client flexibility - in my game, I quite often get last minute update requests, which can come in at all times of day or night, due to the end client often being the other side of the world. If any of these came in, I had to get back to my studio, which is a ten-minute drive away. I'd also lost creative flexibility - the ability to be able to write a blog post, do some sound design, or update a video edit, while the idea is fresh in my head, wherever I may be, is something you don't fully understand the value of, until you are deprived of it. So the hunt was on for a replacement. I needed it to have at least an i7 processor, at least 16GB of RAM, Thunderbolt, USB3 and a 15" screen. After a brief affair with a 17" desktop replacement (not really a laptop due to it being 4kg and huge) I settled on the Dell Inspiron 15 7577, which retails on Dell's own website for £1349, but which I picked up for £1249, off-the-shelf, same day, from a "high street" retailer . This to me ticked all the boxes, plus being a gaming laptop had performance where I needed it for post-production. The Dell peaked at 34%, whereas my main system peaks at 25%. If you cast your mind back to the tests of my "Plan B" system and the Scan PowerDAW PC, my Plan B, which has the same amount of cores at around the same speed, same RAM, and sort of equivalent GPU, peaks at 41%. When it was still alive, my MacBook Pro peaked around 60%. The Scan PowerDAW system peaked around 16%. It's worth taking into consideration that these last two were measured on the 5.1 version of the same feature mix. It is interesting to note though that the Dell's RAM usage is significantly lower than the Main System. I can only attribute this to the GPU on the Dell having triple the dedicated memory. It suggests that as well as offloading graphics processing tasks to the GPU - the Pro Tools and plug-in GUIs, Pro Tools also offloads the memory that graphics processing takes, to the GPU, when it's available, which it is in plenty on the Dell. It's yet another indicator of why the GPU is so important in a DAW host computer. In my review of the zplane elastiqueAAX pitch and time plug-in, I compared how long it took to AudioSuite render a piece of 5.1 audio, against the Avid PNT plug-ins. For this test I compared how long it took each of the test systems to do the same task. Again, having four less threads, the Dell doesn't perform as well as my Main system, taking a whole minute and twenty seconds longer. It did at least beat the MacBook Pro by a comfortable margin. I attribute this to the Dell simply not having the base level grunt that my main system has. Laptops are designed to tick over at a lower rate then "turbo" up to their peak level when needed. You can hear it in the fan on laptops - if there's a delay in it ramping up its speed, it means that the turbo is kicking in late. AudioSuite performance very much depends on the programming though, so your performance may vary using different plug-ins. When at the end of the day, the client asks you, "could you quickly export the mix as is, of this reel, so we can take a look at it with the grade tomorrow? ", having a good amount of Native grunt to power offline processes makes a huge difference to how late you'll be working that night. The performance here reflects the difference in the system usage test, with the Dell taking 50% longer than my main system. There are various factors that can affect this, including the speed of the system drive and the RAM, but also not forgetting the factors listed in the AAX Render test. However, the Dell still did it in half the time it took my old MacBook Pro. A lot of Workstation PC owners don't just use it exclusively for Pro Tools. Among the Expert Team, most of us also do video editing and among the Windows users, Adobe Premiere Pro is the go-to software. I've been noticing Premiere's use rising in Post Production, mainly because of the excellent integration with graphics packages like PhotoShop and After Effects. Last year I made an overview video for a plug-in manufacturer. Here's how long the two systems took to export my final edit to HD H264. It's important to remember that even if you don't do any video work, a good GPU can make a huge difference to how smoothly your system runs. In more subtle ways, you can see the difference in Pro Tools with the smoothness of scrolling and plug-ins. Here using software that takes full advantage of the hundreds of cores available in modern GPUs, you can really see the difference in performance. With this test, the Dell took 50% longer than my Main System, which is kind of odd if you think that the Dell's GPU has triple the RAM of the Main system's but, when you look deeper into the stats of the two GPUs, you find that the Dell GPU has fewer cores than my Main System GPU, which is four years older. The big difference is that the Dell GPU is designed for low power low heat mobile use. Again though, the Dell completed the task more than four times faster than the old MacBook Pro. We've all been there. For one reason or another - maybe you've had to update a plug-in or another piece of software and the installer demands that you do a restart to complete the installation. There are generally good reasons for this - the new software will often have to embed itself within the menu context of the operating system or the software you're using it with. So I decided to test how it took to reboot the system and re-open and play a busy feature film mix with HD video. I'm pleasantly surprised by this result. Given that my main system has four more threads and faster RAM and NVME system drive than the laptop, I was not expecting the plucky Dell to beat it, and even better get close to the restart times achievable with MacOS. Obviously, it didn't come close to the Scan system, but given the difference in hardware, the Dell still turned in a very respectable time. The Inspiron 15 7577 has a fantastic service manual, which gives full details on how to disassemble your laptop and upgrade/replace any of the components inside. This is a really nice touch. It's Dell saying, "This laptop is aimed at and bought by enthusiasts. This type of user generally has a reasonable degree of technical knowledge or at least has a trusted friend. With the right guidance and a chassis that is designed for easy servicing, we trust you to undertake simple upgrades and servicing". How Does The Value Compare To A Current MacBook Pro? The difference in price is instantly apparent. True you get four Thunderbolt 3 / USB-C ports, but one of them is taken by the charger and you need adapters to get to A-type USB3. The RAM is slower and there is only one storage option with no option to fit a second drive into the machine. Granted you don't get the Touch Bar and Touch ID on the Dell, but it does have a fingerprint scanner built-in to the power button and what you lose by not having the Touch Bar you gain by having a full keyboard. Finally, you cannot get a GPU option with the same amount of dedicated RAM - 6GB on the Dell. Trying to compare AMD GPUs to NVidia though is as tricky as comparing MacOS to Windows. Personally, I have good experiences with NVidia, less good with AMD. The real kicker with the MacBook Pro though is that all these components are soldered and glued in place - there is absolutely zero user servicability. But Would You Want To Be Seen In Public With It? They say that there's a certain something about pitching up and breaking out your MacBook. It's all about image. Whenever you see a creative type depicted using a laptop on TV and in films, they're using a Mac. It's the stereotype. Things are starting to change though. Admittedly the construction feels a lot cheaper, though it doesn't feel especially fragile. I personally like the styling - I like the "sound engineer" black casing, the backlit keyboard feels good, which it should as it's designed for heavy use by gamers and the rear vents remind me of an eighties sports car - kind of like the DeLorean in "Back To The Future". That styling serves a very valid purpose - it gets heat away from the CPU and GPU in the most efficient way possible. Large vents mean less obstruction for the hot air to escape. When air is forced through a small outlet it makes more noise. I've only had this laptop five days and I've already grown to love it. Initial setup was a breeze and I had Pro Tools installed and running on it within two hours of getting it home. Being comfortable with handling computer components, I'm very happy that the Dell is user serviceable and upgradeable. It handles most tasks very ably, including a few happy surprises when it comes to Pro Tools and Premiere Pro. At the end of the day, it is a £1250 off-the-shelf gaming laptop. And that's the important thing to remember. If like me, you're suddenly left in the lurch by a piece of kit dying, it's great to know that a decently high-spec replacement machine can be picked up just by nipping down to your nearest high street electronics retailer, plus that it's not going to break the bank or leave you down a blind alley in a few years time. So, to conclude this conclusion, I would thoroughly recommend considering a Gaming Laptop, such as the Dell Inspiron 15 7577, as your next DAW or NLE laptop. 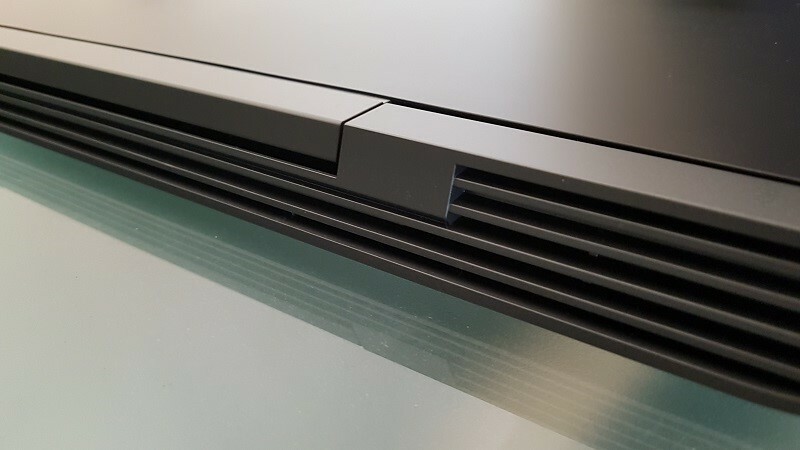 The model I reviewed retails at £1349 on Dell's website and is available cheaper from a variety of electronics retailers, both online and physical.